Over its 26 years of operation, with grassroots participation from many businesses, individuals, and grantors, Camp Prime Time has greatly improved the pre-existing cabins. Volunteers have built boardwalks to provide wheelchair access to restrooms, created and installed a water filtration system to ensure safe and accessible drinking water, installed a new septic system, constructed fire hydrants throughout camp, built two new cabins with wheelchair accessibility and self-contained restrooms, added a new wheelchair accessible tree house, and, currently, working on remodeling the aging Lodge. With over 1,000 campers enjoying Camp Prime Time each summer, an approximately 500 sq. ft. covered gazebo style treehouse has been built to be used by our special campers, enhancing their experience and making their memories even more special. Dedication of the treehouse was on July 29, 2008. 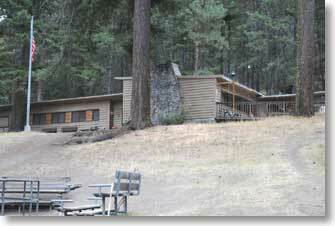 Each year efforts are made to improve the camping program. This ensures that families are able to build a network of support, and focus on quality time together, while watching their children engage in activities that otherwise would not be readily available. Some of the upcoming projects are listed below. If you are interested in more information (or to participate in a project), please contact the Prime Time office. Also, be sure to visit this page again in the future for new pictures and updates on how the projects are progressing. 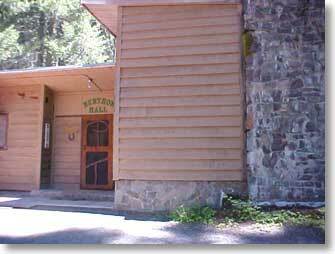 The Main Lodge is a very functional old building that has needed some major improvements. For the past couple years we have worked on remodeling the lodge to be more useable, while retaining its historic characteristics. The work will add handicapped accessible restrooms, strengthen the roof structure to resist snow loads, enlarge the playroom, and provide sleeping space for the volunteer staff and apartment for a caretaker. Each Spring we schedule work camps for volunteers to come up to Camp Prime Time and help us get the camp ready for the summer camp season. If you want to help Camp Prime Time's mission, but can't volunteer a whole weekend during the summer, here's your chance! Come and participate in one of the weekend work parties before camp starts. Many hands make the work easier. See the Special Events page for the next Work Party dates. To make our boating program more accessible to our campers, Prime Time has reconstructed the boat dock at Clear Lake. This work benefits both our campers and the general public. The project was coordinated in 2007 with the US Forest Service, the Bureau of Reclamation, and Washington State Department of Fish and Wildlife.